FANBOY PLANET.com . : Justice-League-Gods-and-Monsters :. It's a dark world out there. Apparently our escapist fantasy has to reflect that darkness. At least, that seems to be the Warner Brothers mandate on screen and now in animation. Just in time to set the stage for Batman v Superman, Bruce Timm (co-creator of Batman the Animated Series, Justice League Unlimited and more) returns to present his alternate universe Justice League, dark, grim, and gritty, and you know what? It's ultimately more optimistic than what you'd think. 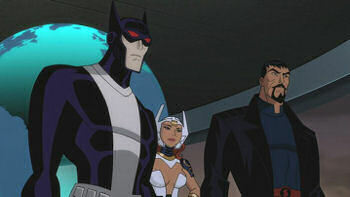 In Timm's dark vision, the League really consists only of the "Trinity" -- Superman, Batman, and Wonder Woman. The world around them is chock full of references to DC's scientific heroes, all of whom sprung from good old Ivy University, a hotbed of genius. And why not? It turns out they're all also students of Lex Luthor, presented as an almost reasonable person here, and almost unrecognizably voiced by Jason Isaacs. It's at Ivy University that the real crux of change happened. In case you're afraid that Timm has messed with your idols, it turns out that none of the Trinity are the characters we know at all. At Ivy, it's Michael Morbius disguised as Kirk Langstrom (Michael C. Hall) who turns himself into a vampire Batman, unwittingly aided by Will Magnus (C. Thomas Howell). Timm has left a lot of room to explore this world, as the story of Langstom crossing paths with this world's Superman, Hernan Guerra (Benjamin Bratt), gets only vague allusion. And though her origin is told, it's unclear how this world's Wonder Woman, Bekka (Tamara Taylor), joined up with the other two. But they are bound by Superman, here by a twist of Kryptonian genetics the son of Zod and not Jor-El. Part of his arc is to break free of a heritage he doesn't even know he has, as well as to honor and fight against the injustices he witnessed growing up as the adopted son of migrant farmworkers. That alone feels like it should be a series, rife with possibilities for commentary. But it can only be lightly explored when you have just 70 minutes to build a world. Not only does the new version of everyone need to be explained, the story has to have a plot. This Justice League might not be nice, but they're at least fighting on the side of the angels. Yet someone is framing them with armored androids that look suspiciously like OMAC Units to long-time fans. These androids simulate the Justice League's powers, and are killing off Luthor's former students, starting with Victor Fries and Ray Palmer. It's a decent enough mystery, and the uncertainty of this new world keeps the plot humming. As the League fights to clear its name, it's also clear that their arrogant demeanor has caused half their own problems, and so they're set on an arc of potential redemption. With a webseries also exploring this universe, there's a possibility that will be even further explored. DC also launched a tie-in comic book last week, and it might be worth picking up to fill in further back story. 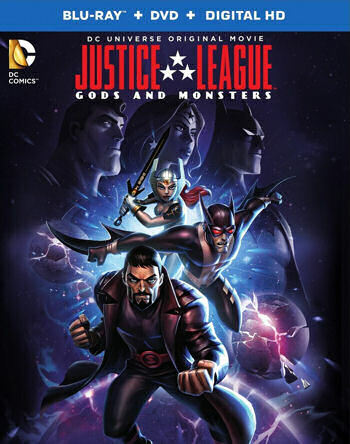 But I'm a proponent of a movie standing on its own, even when tied into a larger universe, and Justice League: Gods and Monsters does do that. It's a welcome return of Timm to the animated movies, partially because it's just comforting to see his designs once more, even if his versions of the characters aren't exactly comforting themselves. Certain key League members are missing, so perhaps there's room for another installment somewhere down the line, if Timm is so inclined. But if not, it's a worthy experiment, and not quite what you might have expected.